I see that McLaren's J-damper has become a talking point again, with Grand Prix dot com running an article about its invention at Cambridge University. 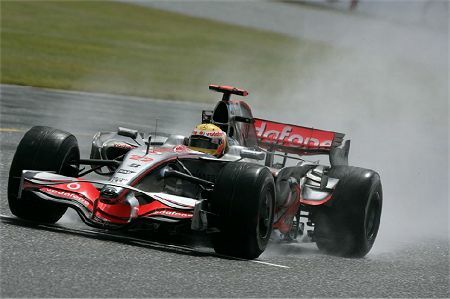 It now appears that McLaren had a deal with the university for its use in F1 and have been using it since 2005. As I have pointed out before, the J-damper has hardly been a secret weapon ever since the revelations of the WMSC Renault hearing last year. In fact, it now appears that Cambridge published its invention in 2002 and that was how McLaren became aware of it. So the damper or "inerter" has been out there in the open for anyone to pick up until McLaren came along. It is stretching a point to suggest that McLaren have been cheating because of their inerter. Clearly, the FIA knew about it because they passed over Renault's query on the device, saying that Renault "had not understood how it works". But it does make the FIA ban on Renault's mass damper in 2006 even more suspect; surely if the mass damper was judged to be an aerodynamic device, so was the J-damper. Apparently, several teams have been using J-dampers from the beginning of this year and Renault was late in fitting them. So it is accepted as legal and hardly a hot subject for debate at this stage. I presume that Grand Prix ran the article at this time because of the lack of other news in the three-week break. It has made its little stir amongst those with short memories but will be lost again in the excitement of the forthcoming Valencia GP. There is just one statement made in the article that I would argue with, however. This is the assertion that "the rules of Formula 1 mean that there is little room left for innovation but Cambridge University's engineering department has just revealed that this is not the case at all." That is overstating the case considerably; the J-damper was a minor invention of six years ago and has made only a marginal impact on F1. Since then, the rules have become even more restrictive and the opportunities for clever engineering tweaks correspondingly rare. Recent rumors of engine power outputs being increased by fuel and lubricant research have proved that the restrictive rules of F1 continue to fail in the quest to reduce costs. If a team has the money, it will find a way to spend it. The FIA should face up to this and free up the rules again while finding more effective ways of limiting expenditure. You can't expect consistency from Max. The guy has been leading a double life for 50 years by his own admission. Who knows he may be living more than two lives? If the mass damper is illegal which clearly it should not be then it goes without saying that the J damper should be. Of course anyone with any sense would say that the hub caps that Ferrari claimed initially were for brake cooling and then in Canada had to take them off to stop their brakes overheating were illegal aero devices and breach at least three or four different rules. One other inconsistency about J-dampers is their use by teams other than McLaren. If McLaren are not allowed to use what they learned from Ferrari why is Renault and everyone else allowed to use McLaren info that is only in the public domain because of the Renault spy case. I think the point that the FIA has made decisions based on politics or preferences is clear enough. After the shameful revelations of Mosley's hobbies and interests, one would expect the FIA to be doing its utmost to clean up its act, however. Maybe I am being too optimistic, especially while Max remains in charge. It really was an awful blunder to let him continue. Tell the FIA politicos that, Clive. Max created a system where everyone has become dependent on him and him alone. They need him as much as he needs them, and they're scratching each other's backs, so to speak. And in the FIA, it seems, everyone's first interest is their own. I'm waiting for the moment the FIA notice that the entire F1 car is a movable aerodynamic device that is controlled from within the cockpit, and therefore every one of them is illegal. After all, when you drive the car, air moves around it in a deliberate and controlled fashion. Functions aside, what boggles me is that if the mass damper and the J-damper serve the same function, and Renault made the mass damper first, why did the motorsport council determine that Renault engineers didn't understand how the J-damper works? From a spectator's point of view, they seem to be the same thing and therefore, there is no reason why Renault wouldn't understand the device they invented in the first place. This ludicrous statement explains where F1 loses out from being so secretive. We can tell that the mass damper and J-damper mustn't be the same thing, because there is no way that Renault's engineers are that thick, but since we're not allowed to know how they work, we have no idea why one is a "moving aerodynamic device" and the other is simply an inertial damper. OK, so do we know anything about where the J-dampner is located and what effect it has on the car? I always thought the banning of the mass dampner was a ploy to hand Michael another championship. I don't think any other driver was ever accomodated as much as he was. I have never seen any evidence of this, but I've always assumed that if it is really a damper, than it is an exposed piece of suspension on the front and/or rear axles. The J-damper causes the suspesion and chasis to move out of phase and enable better traction and smoother ride (and therefore better aerodynamics). Renaults was a mass damper completely seperate from the suspension, the J-damper is part of the suspension and therefore not counted as an aerodynamic part. They however do exactly the same job and I agree that the renault device was probably banned to help Ferrari as with practically every other decision the FIA make. What I don't get is why there are so many restrictions in F1. Let the engineers make great race cars and let the great drivers race them. Thank you for that excplanation, Lee. I agree with you totally that the rules need freeing up so that engineers can once again try new solutions to the business of making race cars go faster. At the moment, they are so limited in what they can do that ingenuity has been virtually outlawed. I believe the reason the Renault TMD was banned was for similar reasons that the Lotus dual-chassis was banned back in 1981 - while physically much smaller, the TMD was a separately suspended sub-chassis which moved independently from the main chassis. In the electrical analogy it had only one "terminal" relative to its contribution to chassis/suspension dynamics. The inerter, analogous to the capacitor in the electrical circuit model, has two terminals, the same two as the spring & damper, and participates as a fully integrated part of the wheel/suspension/chassis connection. So it appears that the rules have been applied properly and worked this time. Thanks for the explanation, Laird - although I'm still not sure how the mass damper worked. At the time, it seemed that it was a part of the suspension and we knew that it was not only Renault that was using it. They happened to be the team that was making best use of it, however. We were told that its function was to control wheel movement over bumps and curbs - surely a very different purpose from Lotus' dual chassis, which was intended to circumvent the banning of skirts by having an internal chassis inside the main one that then lowered itself to the ground at speed, so enabling ground effect to generate downforce. I have not seen any description of the mass damper that mentions such an intent. It seems strange to me that, if Renault were using it to increase downforce, this was not explained by the FIA, particularly since there was widespread criticism of the ban for "aerodynamic reasons". That is a major factor in the cynicism regarding FIA decisions these days - the fact that they ban things that have an influence on the championship without giving a clear explanation of the reasons for the ban. To the onlooker, a claim that a component that is not in the airstream has an aerodynamic effect requires considerable explanation. "You can't expect consistency from Max." Oh yes, I can. If I expect Max and Co to take decisions that favour red cars (or be to the disadvatage of anyone who gets too close to the red cars), then i think you'll find I'm right 80 % of the time, or more. "As far as I'm concerned, the Renault device was not an aerodynamic device and neither is the McLaren device. The fact that one is considered such and the other is not creates an inconsistency"
Both of the devices have the aim of controlling suspension movement with the aim of keeping the aero package working at a level close to its peak effectiveness. So both of the devices are movable and both have an aero effect. Does that make them both 'movable aero devices' and therefore to be banned? Well, apparently not. The (revisionist) word out of the FIA recently now seems to be that the effects of the Renault implementation coming detached in an incident were unknown but the Macca boys implementation was easier to asses in this regard. On its own, this sounds fair enough, but you have to ask why this presentation of the 'facts' wasn't the one that came out at the time. This would also imply that an 'a la Renault' mass damper could be legal if contained in, eg, a box (but I'm not suggesting that anyone try it). The real story seems to be that by that time they got around to doing anything about the Macca version 80% of the pit lane was already using it (including red cars - the failure of their implimentation of the J-Daper being blamed for the mid-season non-finish of Massa's car - When was the last time that you heard of an F1 car's rear suspension failing without contact or obvious abuse? Surely that tells you that on that day the car had something fitted that hadn't had the usual 'test, test, test' cycle applied to it.) and the other 20% were already testing theirs. So, there was no advantage or disadvantage to be gained by banning it as everyone either already had it or would have it before the decision came out. "I have never seen any evidence of this, but I've always assumed that if it is really a damper, than it is an exposed piece of suspension on the front and/or rear axles." OK, you are pushing words to the limit that they can take, here. They do 'damp movement' in the conversational sense of limiting it, but to a student of system dynamics they are not dampers in the sense that dampers/shock absorbers are dampers (i.e., they do not have the energy loss function that a 'damper' has, nor do they have the same relationship between force and excitation frequency that a damper has). Given that the existing springs/'dampers' (however many of them there are) aren't exposed, I'm not sure what you mean by the 'exposed' comment. "What I don't get is why there are so many restrictions in F1. Let the engineers make great race cars and let the great drivers race them." There really do have to be regulations and very restrictive regulations, i'm afraid. Having done this at a lower level of Motorsport, you'd be surprised, even with a seemingly regulated race formula, how many ideas a bunch of clever people can come up with if you lock them in a room and don't let them out until they've thought of a way of making cars go faster that are at least arguably within the rules. if you don't have regs, you end up with a race between the people who take dangerous chances and those who don't. Now as to the question why those rules aren't competent, well, that is another question. Thank you for that long and exhaustive comment, Mark. i think what Steven Roy was saying is that the only consistency about Max is the very inconsistency you point at - that Max will always favor the red cars and penalize any team that challenges them. On that point, the two of your agreed. Your argument for the acceptability of the J-damper as opposed to Renault's mass damper is not quite correct, however. You say that the J-damper is allowed because so many of the teams are already using them and this is true - but the same was true of the mass damper. Even Ferrari were using them in 2006 and it seems strange that the FIA should have waited until most of the teams were doing so before deciding that they were "movable aerodynamic devices". My conclusion has to be that they were banned because Renault were making the best use of them and it was a way of handicapping the team to ensure that Ferrari caught up. Clive "Your argument for the acceptability of the J-damper as opposed to Renault's mass damper is not quite correct, however. You say that the J-damper is allowed because so many of the teams are already using them and this is true "
Well, that wasn't quite the point that i intended to make. I am distinguishing, in this context, between the reasons for things and the reasons thant people use to justify their actions.
" - but the same was true of the mass damper. Even Ferrari were using them in 2006 and it seems strange that the FIA should have waited until most of the teams were doing so before deciding that they were "movable aerodynamic devices"." " My conclusion has to be that they were banned because Renault were making the best use of them and it was a way of handicapping the team to ensure that Ferrari caught up." That's also possible too, of course. By the way, I wasn't saying that there will always, and for ever, be bias in favour of red cars. In writing "I'm right 80 % of the time, or more", the remaining 20% was to account for the fact that sometimes the red cars will be so far ahead that penalising them might be the best way to make the season seem a little more exciting without actually having the risk that some other team might overtake them in the final standings. I agree that the FIA will adjust the rules to keep Ferrari from getting too far ahead. We are saddled with a rather ridiculous scoring system for that very reason - it was introduced to hold back Michael Schumacher in a year of complete Ferrari dominance and the expansion down to eighth place since has not helped. It all amounts to the governing body manipulating the sport for the sake of "the show" and that is what the true enthusiast cannot stand.